Spring has officially sprung and I don’t know about you guys but that makes me very happy. I love the longer days, warm sunshine and all the bright and colorful flowers starting to bloom. We are spending more and more time outside and the fresh air has been good for the soul. 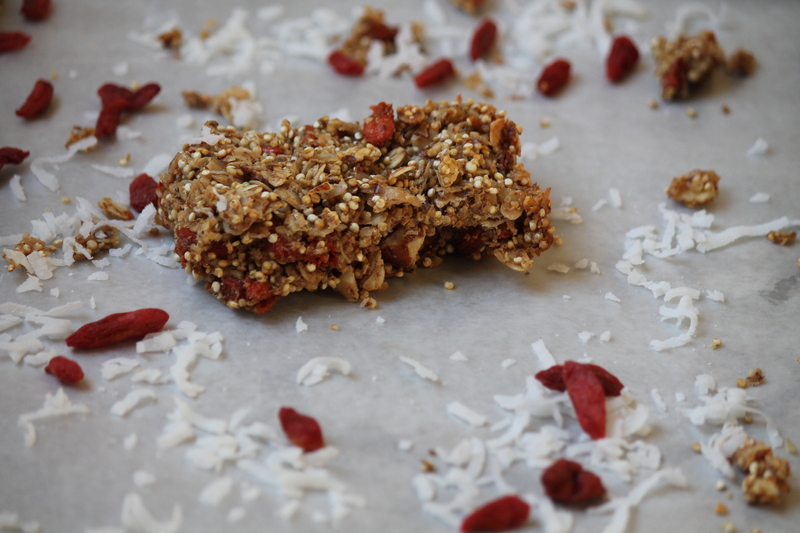 Today I’m celebrating the start of spring with these delicious and nutritious Coconut, Almond and Goji Berry Energy Bars. I know I say this a lot but I love to keep homemade snacks on hand to quickly grab when hunger strikes. 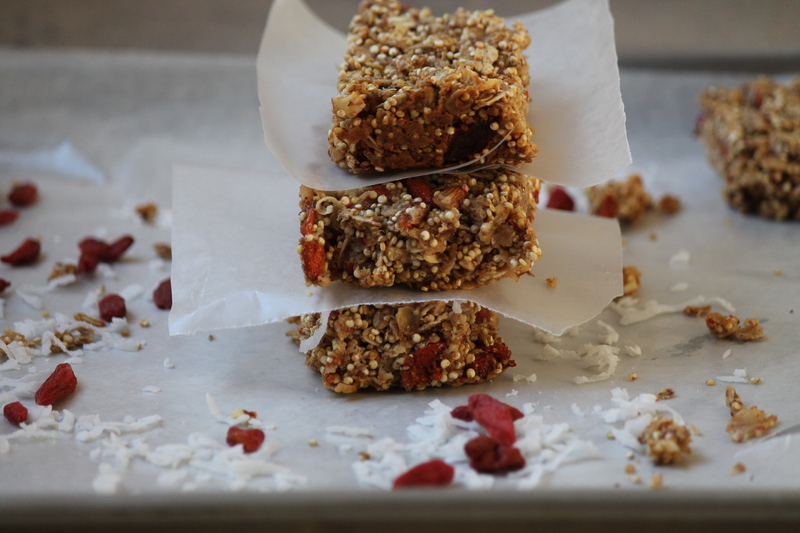 These energy bars are packed with good for you ingredients. By making them yourself you can keep them healthy by knowing exactly what your putting in them, which isn’t always the case with other store bought snacks. These slightly sweet and crunchy bars pack in a substantial amount of protein without the use of a protein powder. They’re perfect as a pre or post workout snack or a little pick-me-up in between meals. Goji berries are known by many health experts as being an antioxidant and anti-inflammatory superfruit. Goji berries are low in calories and an excellent source of fiber. Other health benefits include the ability to help fight diseases, boost energy levels and promote healthy skin. In other words, you should definitely make these bars for a healthy and delicious snack to enjoy. Spread oats and quinoa on a baking sheet. Bake for 8 minutes or until lightly browned. Cool then place the oat mixture in a large bowl and stir in the goji berries, almonds, coconut, and flaxseed meal. Combine the almond butter, honey, coconut oil, salt and vanilla in a small saucepan over medium heat. Bring to a boil. Cook 1 minute, stirring constantly until everything is smooth. Pour the almond butter mixture over the oat mixture. Toss well to coat. Press the mixture into an 8" lightly greased square baking dish. Bake at 350 degrees for 12 minutes or till lightly browned. Yum! 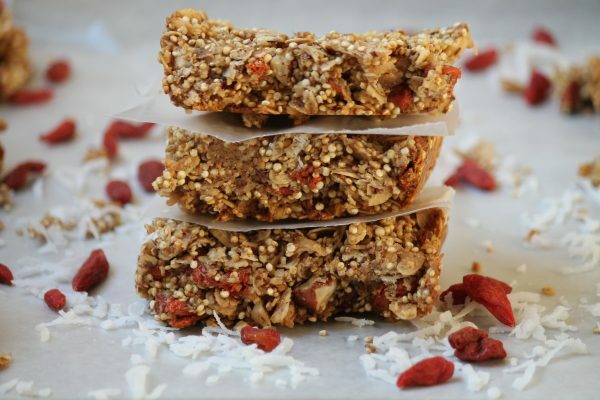 Great way to use goji berries, these look tasty!